There are several I/O devices that use INSTEON technology. The I/O-Linc module (available for purchase here) has a single input sensor and output relay. Using this device definitely falls into the Hard category; not necessarily from the Indigo standpoint, but also from the hardware setup side as well. How-Tos are challenging, since these devices, by design, can be used for a very wide range of solutions. The Upon I/O-Linc broadcast of ON or OFF radio button options determine how Indigo updates its internal Device state information when the I/O-Linc broadcasts ON or OFF. Note that the I/O-Linc broadcasts the same ON/OFF commands when either the input sensor changes states, or if the SET button is pressed (which toggles the output relay). If you never use the SET button to toggle the output relay, then the first option, Update Indigo's internal Device input sensor state, is best. Indigo will quickly update its internal binary input value from 0 to 1 as the I/O-Linc sensor changes. 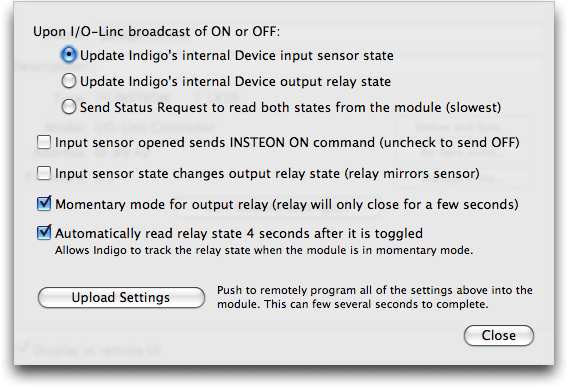 If you are not using the I/O-Linc sensor at all and just want control of the output relay, then choosing the second option, Update Indigo's internal Device output relay state, is best. Indigo will update its internal binary output value from 0 to 1 as the SET button is pressed (which controls the output relay). The third option, Send Status Request to read both states from module, will send an extra Status Request command to the I/O-Linc to read both the input sensor and output relay states whenever the I/O-Linc broadcasts any ON/OFF command. Although accurate, this option is the slowest. It should not be chosen when the I/O-Linc input sensor or output relay is quickly toggled. It is possible that the status request commands will not be received by the I/O-Linc until after the input or output has toggled back to a different state. The Input sensor opened sends INSTEON ON command checkbox determines which INSTEON command is sent by the I/O-Linc when the sensor is opened. The opposite INSTEON command is sent when the sensor is closed. This option is useful if you have other INSTEON modules directly linked as responders to the I/O-Linc. The Input sensor state changes output relay state checkbox will cause the I/O-Linc to automatically toggle the output relay state as the internal sensor is opened and closed. The Momentary mode for output relay checkbox will cause the I/O-Linc to automatically open the relay a few seconds after it is closed. As an example, this option would be useful if you had the output relay wired to control a garage door. This would simulate pressing the garage door open/close button for a couple of seconds and releasing. The Automatically read relay state 4 seconds after it is toggled checkbox is useful when the Momentary mode for output relay checkbox is chosen. When the I/O-Linc automatically opens the relay a few seconds after it is closed it does not broadcast back to Indigo any type of status changed command. By enabling this option, Indigo will automatically read the status of the input sensor and output relay a few seconds after the output relay is initially closed, and thus will keep Indigo's internal input and output states in-sync with the I/O-Linc. Use the Device State Changed Trigger type for actions you want to occur whenever the input sensor opens or closes (Binary Input 1 inside popup control) or the output relay is turned ON or OFF (Binary Output 1 inside popup control). Additionally, you can use the INSTEON Command Received Trigger type. For most purposes we recommend triggering off of the device state changed instead of the insteon command being received, but there might be cases where the latter is useful. We'd really love to see some How-Tos linked from this page illustrating various ways that you're using the various I/O devices. Here's a nice How-To that talks about alerts and the I/O Linc garage door kit. The I/O-Linc supports multiple momentary modes (A, B, C). From Indigo you can change the momentary mode by choosing the Interfaces→INSTEON/X10 Power Line→Set I/O Linc Momentary Mode… menu item. I/O modules (I/O-Linc, EZIO8SA, EZIO2X4, etc.) have different numbers of inputs and outputs. Therefore the standard way to address these input and ouputs is via AppleScript Lists. Notice that although the I/O-Linc Model has only 1 input and 1 output you must still address these as lists of one as in the following examples. set someList to binary inputs of device "IOLincName"